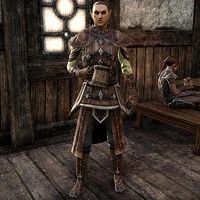 Cuinur of Cloudrest is an Altmer patron of The Bay Tar's Mess, one of the two inns located in the city of Evermore. When spoken to he will remark "Duke Renchant appears to be trying his best. Alas, his best is woefully inadequate." However, when Duke Renchant is removed from power, he will instead say "So the Imperials want this city? I say let them have it. We can all amble away while they're still busy raking up the bird droppings Auri-El know that'll take an army. This page was last modified on 19 September 2018, at 05:04.